Curacao, a small Dutch Caribbean island, offers unbeatable vacations. All kinds of water sports such as diving, sailing, snorkeling, jet skis and fishing tours are in abundance in Curacao. Since the island holds some of the oldest buildings and historical landmarks, sightseeing tours will teach you everything you need to know about this diverse island. Read on for tips on traveling to Curacao island. Curacao is a place of diversified culture and business and offers plenty of attractions. The island itself holds a significant rich history with striking architectural designs and monuments. 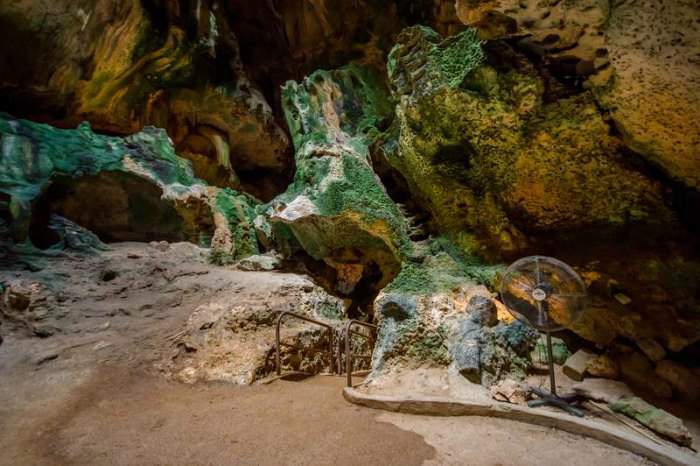 You will never regret visiting Hato Caves while on Curacao vacation. The history behind this attraction dates back to when the island was still inhabited by slaves. Hato Caves served as a hide away point for those slaves that ran away. The fugitives used to hide in the caves for months and even left drawings on the walls. This is a great tour to take if you are interested in the history of the island. If you are into diving, then visiting the most popular Tugboat Wreck dive site is a must! Even though it is located close to the industrial and docking area, it is still the best spot to explore what's underneath the water. Queen Emma pontoon Bridge and Queen Juliana Bridge are two major points of interest that attract the visitors of Curacao island. 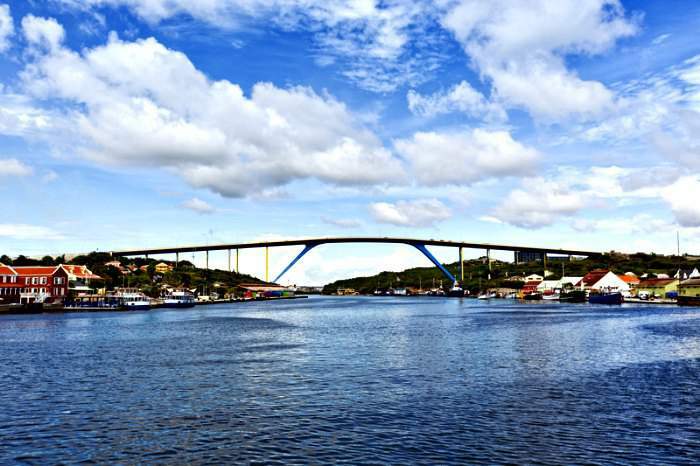 Queen Emma Bridge connects two of the major quarters of Willemstad, Punda and Otrobanda. The Queen Emma Bridge was build back in 1888 and was fully renovated in 1938. Queen Juliana is a bridge with four lanes that goes across St. Anna Bay. The bridge first collapsed in 1967 and killed fifteen of its' workers, but was later replaced and opened again on April 30, 1974. Visit the Kurla Hulanda Museum and it will take you back centuries ago to explore the cultures of Curacao, the African slave trade and how the island developed and progressed over the years. It might not be an fun thing to do, because the guide will take you through all the things the slaves endured while living on the island, but it will definitely help you understand who and how put their lives on the line for the island to be free and flourish with prosperity. The best time to visit the beautiful island of Curacao would definitely be in its' off-season time, since the rates for the hotels and resorts are significantly lower. Some accommodation options even offer a 50% discount, so it's a great opportunity to send yourself on that well-deserved Curacao vacation. The Curacao island's off-season starts in mid-April and ends in mid-December, right before the Christmas holidays. During this time, there are less tourists, the vacation is more affordable and it's still a perfect opportunity to get that glowing suntan. Chances of showers only become higher in October and last until February, but most occur at night time anyways, so they will not ruin your Curacao vacation. Temperatures during the rainy season stay the same as in all other seasons of the year at 27 degrees Celsius (80 Fahrenheit) with bright sun and light tropical breezes. January and February are the most fun months for traveling to Curacao island. They fall in the Curacao island's most talked about event called Carnival. Carnival is celebrated by everyone young and old and is the biggest cultural manifestation of the island of Curacao consisting of pageants, public parties, street parades and community competitions. The month of June not only brings bright and warm weather but also one of the best entertainment on Curacao island called Heineken Regatta. This is a family event with a big sailing competition, which is the main attraction of this celebration, live music, dancing, lots of activities for the kids, and a total blast. No matter when you are planning on visiting Curacao, there is always plenty to do, a variety of places to visit and explore and the never ending fun to experience. Curacao is located approximately 60 km (37 miles) north of the coastline of Venezuela and is considered to be the sister of the two other Dutch islands Bonaire and Aruba (the famous ABC islands) that are situated in the Caribbean sea. 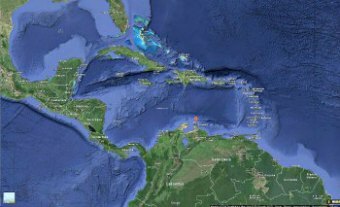 It is also about 740 km (460 miles) southeast of Dominican Republic, 720 km (447 miles) southwest of Puerto Rico and 853 km (530 miles) west of St. Vincent and Grenadines. 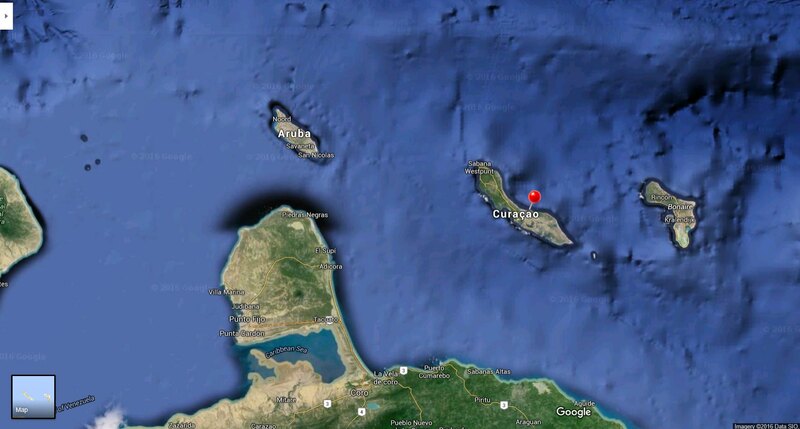 Even though the land area of Curacao island is calculated to be 61 km (38 miles) in length and no more than 12 km (7.5 miles) in width, is it still considered as the largest and the most populated island of the Netherlands Antilles. Oil refining business and other industries including tourism make this island a very well-developed Caribbean destination with a high standard of life. Willemstad is the capital city of Curacao island. According to its' government, there are about 750 historic buildings located in the heart of the island. Even though the capital is quickly evolving and transforming into a beautiful modernized city, it still keeps its significant monuments and history alive. 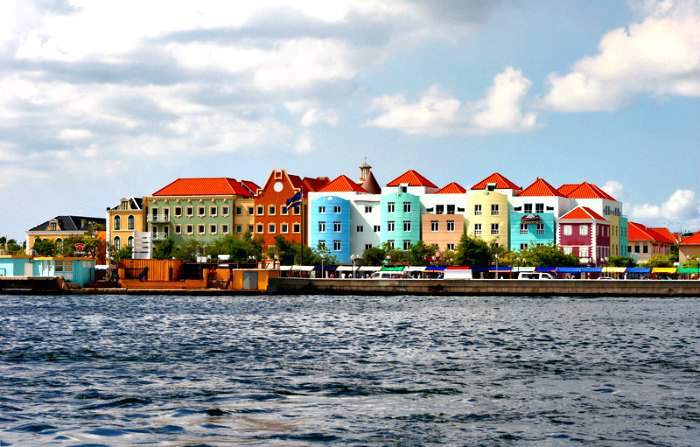 Willemstad is located on the southwestern coast of Curacao with the population being about 140,000. The city invites to observe painted houses with eye-catching vivid colours like green, orange, pink, blue. Willemstad has museums and historic architecture. The island is a pleasure to explore by foot, so grab your camera and go on to learn about Curacao's historical and modern day culture. 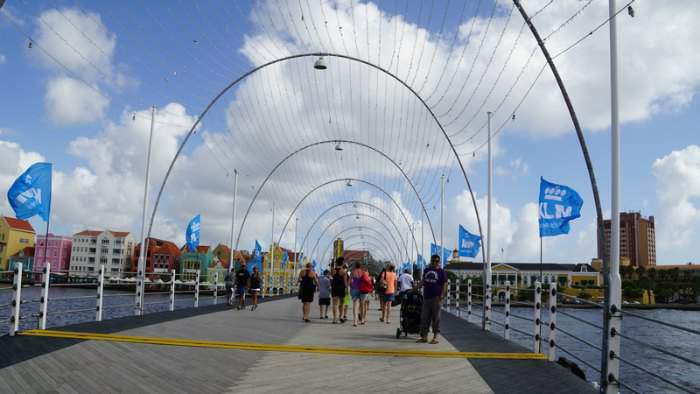 There are 2 districts in the capital city of Curacao called Punda and Otrabanda which are separated by the Santa Anna Bay and linked by the famous Queen Emma Bridge. While Punda offers things like extensive shopping experience, fine dining, museums, monuments and markets, the Otrobanda is a more laid back community with a lot of narrow alleys and streets and private homes. What can be better than bringing some of the highlights of the island back home? When visiting shops in Willemstad tourists are able to purchase things like dutch embroidered linens, fine cheeses, local artwork or other great finds. Although you can bargain in some of the shops, prices on jewellery, watches and electronics are not negotiable. If you are looking for a more traditional shopping experience, check out the Handelskade Floating Market. Every morning, at 6:30 many Venezuelan vendors stock up their shelves with fresh produce such as vegetables, fruits, spices and fish. In regards to the prices it's a good bargain; however, try to arrive earlier than later, when the auction is still up and running with good deals. Most of the population in Curacao consists of people of African decent, but other ethnic groups live on the island as well. The population in Curacao as of May, 2016 is 158,635. According to 2015 statistics research, the median age on the island totals at 36.1 years. People in Curacao are very friendly and helpful. If you are lost, need directions or explanations, they will always be there at your service and ready to provide their assistance. The Dutch that colonized the island were Protestant; however, the prevalent and most practiced religion in Curacao was and still up to this day is Catholicism. The Dutch that have occupied the island have made Curacao their motherland for many decades. Dutch is the language of instruction that is taught in all schools and used in all business and government operations. A lot of students from Curacao go on to study in Holland, some of them return to the island and some of them settle in other parts of the world. Jews and people of African decent are two other ethnic groups that reside in Curacao. The first Jewish residents of the island settled here back in 1659 and had a great impact on Curacao's culture, economy, politics, and life in general. However, the African inhabitants' impact on the community was great as well. Not only the majority of the island's population is of African decent, but also all the traditions that the Africans endured during the time that they were slaves are still present to this day. Tambu, the ancient form of music and dance, is a very important part of African heritage. Africans were brought to the island as slaves, but passed its' traditions of the beat of a drum (the origin of tambu) to the Curacao island and its' residents. If you look into traditional houses where the locals reside you will most likely see a kitchen painted in red colour with big white polka dots. A lot of kitchens have that wall design for a very funny but clever reason. Flies and mosquitoes love searching kitchens for something to eat, so when they see white polka dots, their heads spin and they leave quickly. It's a brilliant yet very simple idea to keep the flies away from the food. Nothing is more popular that a bottle of Blue Curacao, but be careful who you buy it from. The original makers of this liquer have never applied for a patent; therefore, imitations of this delicious drink are scattered throughout the world. Customers need to be aware of the fact that if Blue Curacao is not originally purchased on the island chances of it being not authentic are catastrophically high. Locals on the island speak a number of languages including Dutch, Papiamento, Spanish and English. Papiamento is a mixture of 3 languages: Spanish, Portuguese, Dutch and some African dialects. It was originally a language of speech among the slaves, but was later adopted by their Dutch masters. English is widely spoken on the island as well, so tourists will be able to freely speak the international language. Curacao is becoming a lot more accessible from other parts of the world like Europe, United States and Canada. The island services many international airlines with connections to most parts of our planet. Check with your airline company to see what is the closest city to you that they fly from. Getting to Curacao island by air is not the only way to experience beautiful Curacao. There are two docking spots specifically designed for those that come here by cruise ships. The airport is located within a quick 20-minute drive from Willemstad, so if you are taking a taxi to your resort it will not be hard on your wallet. Curacao's Hato International Airport that is located in Plaza Margareth Abraham on the north side of the island, is able to accommodate aircrafts of all sizes. Hato International Airport is a large modern facility with the third longest commercial runway in the entire Caribbean region, and welcomes a minimum of 1.6 million travellers every year. Curacao island offers a number of different accommodation options suitable for any family size and budget. 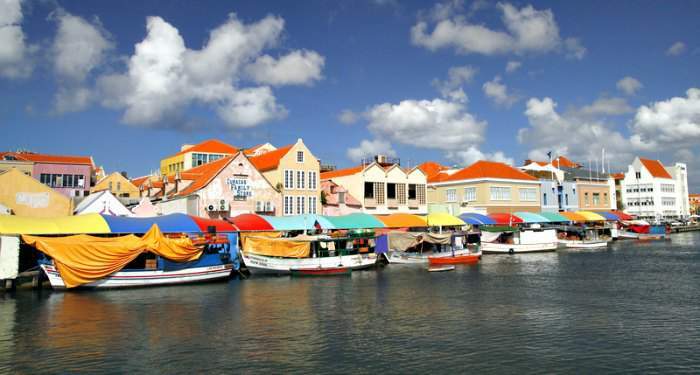 Most of the resorts are around the capital city Willemstad and they are easily reachable by foot or by shuttles buses. A number of the resorts are located a little farther from the center but still provide the best amenities and things to do. Some of the best lodging where divers can explore the sea and the underworld in Curacao are situated on the west of the island, that's where shore diving is at its' best. Choose the lodging that best suits your needs and preferences. The best option for families is to go on Curacao vacation at one of the all-inclusive resorts, where all the food and amenities are included in the price. There are some non all-inclusive resorts available for those that want to have more options in regards to dining and exploring the island. For those that are thinking of staying on Curacao island longer, renting a villa or a bungalow might be a great choice. Those types of lodging are specifically marketed for tourists, primarily coming from Europe. Those that come a long way to Curacao and are planning on staying on the island longer than a week may rent these self-catering accommodations. The high season in Curacao starts in mid-December and goes through mid-April. Rates will jump very high during that time and the island will experience a significant number of tourists. Curacao is under the hurricane belt so severe tropical storms and hurricanes are extremely rare. Off-season in Curacao runs from May to November, and even though the weather is slightly cooler with light winds coming from the east, is it still an amazing time to come to the island. From the month of October until about February Curacao is experiences more of rainfalls than usual. Although these mostly occur during night time it is advised that tourists carefully check the weather during the planning stages of their trip. The rates drop down to at least 25% as well, while some places reduce their packages even more, so it's a great opportunity to enjoy your Curacao vacation at a reasonable cost while soaking up the bright sunshine rays on the beach. What's great about Curacao's weather is that it stays pretty much the same all year long. Even during the rainiest times, the temperatures hold at about 30 degrees Celsius (86 degrees Fahrenheit) and sometimes dropping down to 25 degrees Celsius (77 degrees Fahrenheit), which most of the times happens either in the evenings or overnight. Weather on the island stays pleasant through all seasons, giving the opportunity for the tourists to vacation here at any time of the year. Public transportation in Curacao is a very inexpensive and explorative way to see the island without having to sit behind a wheel or pay high transportation costs. The biggest bus system on the island is made of traditional metro-style buses and smaller bus system consists of passenger vans that have a sign on their licence plates of a "BUS". The larger bus system is referred to as "konvoy" by the locals in Curacao. Both of these bus systems use two major bus terminals located on the island. First terminal is located in Punda, which is one of the quarters in the historic part of Willemstad, and the other bus terminal is located in Otrobanda, which is the other quarter of the city. Twelve konvoi routes leave from Punda terminal and nine leave from Otrobanda's. Since there are so many bus routes available to tourists, almost all of the attractions and entertainment are accessible by public transportation. The konvoi buses in Curacao run on an infrequent basis, while the passenger vans, that look a lot like taxis and can sit about 9-12 passengers, run on a more persistent schedule. You can check out their run times by finding a cardboard cutout on their front windshield that lists its stops and operation times. Sunday bus service might be a little slower than during the week days, so check the schedule prior to organizing your trip for that day. The bus prices cannot be negotiated, but the route can be. Speak with the driver before take off and ask how close to your destination he can take you. Payment for the trip is accepted at any time before exiting the bus. You can board the bus anywhere on the island, if you are standing at one of the yellow "Bushalte" signs and waiving down a BUS or a Konvoi. 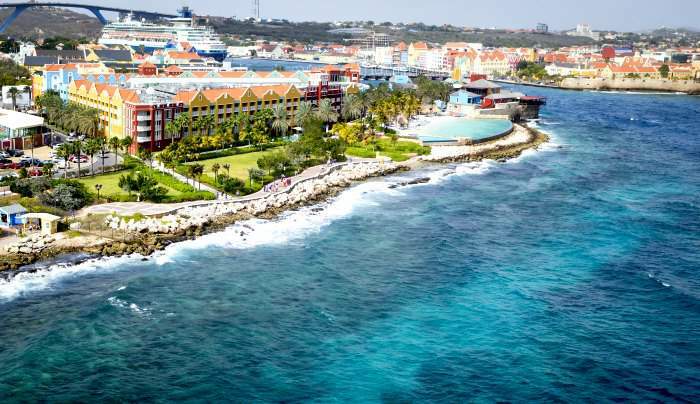 Some of the larger and more popular hotels in Curacao have free shuttle and bus services that take their passengers to the capital city Willemstad, its' major shopping districts, beaches and many other locations. To see if this very convenient service is available at your hotel inquire about such at the front desk. If your hotel does not provide such transportation, then catching a public bus is another option during Curacao vacation. All bus options are a very affordable, safe and efficient way to get around the island for those that are travelling on a budget. Tourists will get to many places for a fraction of the cost. Taxis are another form of transportation around Curacao island; however, they can become costly if they are used on a regular basis. Taxi drivers can also be your tour guides and show you a way around the island, just agree on the price for such service before starting your trip, and enjoy the light Caribbean breeze. Taxis can be easily found either at the airport, at the hotels or in Punda and Otrobanda. Taxis in Curacao are easily recognizable by either checking out their licence plates that always start with "TX" sign or the signs on top of the cars. Taxi fares are unmetered; however, the government sets the price. Taxi drivers always have the rate sheet on hand, so prior to departure check it out to know what your cost will be. All fares include up to 4 passengers. In case there is a group of more than 4 people, then an additional 25% will be added to the bill. If you require a taxi between the hours of 11:00 p.m. and 6:00 a.m. then an extra 25% surcharge will be applied to the fare as well. Taxi companies operate on strict rules, and if you order a taxi, it comes to pick you up and you no longer require a ride, then there is a fee that needs to be paid to the driver for making it all the way to you. The best way to see the beauty of the island is by renting a car during Curacao vacation. Public transportation will not get you to many places on the island that you would like to explore and taxis can cost quite a bit and be heavy on the wallet. To enjoy your exploration of the island rent a vehicle, grab a camera and enjoy the never-ending magic scenery of Curacao. Driving in Curacao is on the right-hand side, while turning right on the red signal is prohibited and is against the law. Seat belts need to be worn at all times and motorcyclists require helmets when driving. Children younger than 4 years old must also be securely fastened in their car seats to ensure safety. The speed limit on the island in town or residential areas is 40 kph (25 mph) and if you are driving outside of the city the limit is 60 kph (37 mph), unless otherwise stated. Most of the gas stations are full service, but only a few operate on a 24-hour basis. In order to operate a vehicle you just need a valid driver's licence. It is not required to obtain an international driver's licence as on other Caribbean islands, so the one from your home country will work just as fine. Driving is very easy as most of the roads are evenly paved and fairly smooth. If you drive outside of town to a more deserted areas, you might find roads with large potholes here and there, but the government is working on improving those as well. Other drivers on the roads are friendly and drive with caution. They are so considered that sometimes you will get a right of way when it is not your turn to proceed. There are a lot of foreign drivers on the roads in Curacao as well as the locals, and the traffic rules are quite the same as those in United States and Europe. Since there are a lot of wild animals that might be close to the roads such as donkeys, goats and iguanas, it is strongly advised not to stop to feed or photograph them. If you see one on the road, let it cross or if the animal is not in your way and not in danger of being hit, simply continue driving. Another very important thing to keep in mind when driving through Curacao is that even after a few drizzles of rain, the roads get extremely slippery. You will notice that many locals slow down during wet weather, because it is dangerous to drive on Curacao's roads when rain is in affect. Keeping all these simple rules in mind will make your driving on the island pleasant and enjoyable. Currency in Curacao island is called the florin (a.k.a. the guilder). It abbreviates as "fl" or "NAf" on the price tags in stores. Even though tourists can use U.S. dollars around the island, the change most of the times will be provided in local currency. Major credit cards are also accepted practically anywhere in Curacao and spotting ATM bank machines is as easy. If you require to withdraw money or perform some other banking activity using the ATM machine, just look for either a "Bankomatico" or "Geldautomaat" sign in the airport or major population centers, and keep in mind there might be a withdrawal fee. Credit cards like Mastercard and Visa are accepted by most establishments; however, tourists may experience issues with using American Express or Discover cards. Check all of that information with your bank in advance so your Curacao vacation will run smooth and stress-free. Euros are accepted by some of the hotels and diners, but do not circulate freely in Curacao like United States dollar, which is accepted by most hotels, stores and restaurants. And because the supply of U.S. currency is not high, the change is usually given in florin. Check with your hotel accommodations prior to your arrival and inquire about their current exchange rates. Currency exchange is possible virtually anywhere on the island. It's best to exchange your larger notes at the airport exchange booth as a lot of vendors will not accept large U.S. bills. Such services are also available at the MBC Bank, Scotiabank, Banco di Caribe, SFT Bank and other banks throughout the Curacao island. Gratuity is a very important factor to consider, when travelling to Caribbean islands. Hotels in Curacao add a mandatory service 12% tax to all of the bills as well as collect a 7% government tax. Visiting a restaurant or any dinning establishment in Curacao will cost you a service charge anywhere from 10%-15% on top of the bill; however, if you find your server or a staff member provided an over-the-top service and was extra attentive to you, then extra gratuity may be left ranging from 5%-10%. Sometimes service charge is not added, so please check your bill extra carefully and appreciate the servers accordingly. It was recently confirmed by the managers of the restaurants in Curacao that the bigger portion of the service charge that is usually added to the bill is given directly to the server. The other small portion is split between other restaurant employees. To sum it up, the server does get most of the service charge that is automatically added to the bill, so no need to tip more unless the service was extraordinary. Porters and bellhops receive about $1 per every bag they assist you with, while housekeeping service get $2-$3 per day in Curacao. Taxi drivers not only provide taxi services but can be your tour guides while you are travelling with them. They do not expect a tip but if you are satisfied with their help, 10%-15% of the fare price is reasonable. If you require help and a simple request is made to the hotel concierge, then no need to leave a tip. If the request is more difficult and requires more of his/her time dedication, then $5-$10 is sufficient. When going shopping for Curacao's goods and souvenirs a 5% tax (known as goods and services tax) will be added to the purchase price. People in Curacao are very friendly and open-hearted, and they try to please you in any way then can making your Curacao vacation a memorable one. Even though not leaving any tips will not change their attitude towards you and a great service they provide, it is of good manners to appreciate the service staff during your Caribbean vacation. There are absolutely no harassment from the inhabitants of Curacao. Generally people have good and mostly satisfying lifestyles, so it is very rare to see homeless people on the streets or someone coming up to you to pester for money. If you do decide to visit an abstracted area further from the resorts and the city, where quite frankly Curacao tourists almost never go, then you might be approached and begged for money. People in a more remote areas might have a less substantial way of life and are more prone to needing money. On your Curacao vacation, you won't run into aggressive vendors, hawkers or endure any type of harassing behaviour. According to travellers, you can freely take photographs while exploring the islands. In fact, the locals will even help you if you require assistance, and there are definitely no set fines for capturing those moments. Safety is the most important thing in one's life, especially when travelling to a foreign country for a vacation. Curacao is one of the safest Caribbean places out there. The island has a very low crime rate, but that doesn't mean the tourists should not take safety precautions into account. If you are enjoying your time on the Curacao beach, please keep your valuables either with you or in your hotel's safe/security box. If your means of transportation around the island is a rental car, do not under any circumstances leave anything in the car or the trunk. Either leave everything in your hotel, or simply take the valuables with you, and you don't have to worry about losing them or being stolen. Passports, credit cards, cash and cell phones can become one of the main targets for petty theft anywhere in the world, and Curacao is no exception. To avoid same, do not be flashy and keep your things with you all the time. While on vacation in Curacao avoid unlit areas and never walk alone at night or in deserted places. Even though it is very difficult for tourists to turn up in shady places, unless they are specifically looking for them, it is important to exercise common sense at all times while on vacation. Sun can be a little too harsh on the skin at times, so packing hats, sunscreen and water bottles in your suitcases is a must. Since tap water in Curacao is of a high quality and is safe to consume, there is no need to purchase bottled water. It is costly and is the same as in the bottle. Just put tap water in your water bottle to keep yourself hydrated at all times and enjoy your time out in the sun. Tourists should put their worries away when it comes to drinking water in Curacao. The water is absolutely safe to drink even from the tap. There is a whole process of delivering fresh and tasty water to the residents of Curacao. The desalination plant filters, distills and purifies the water. Its' high quality even exceeds the standards of World Health Organization and is known for its' chemical purity. Since Curacao is a very hot and dry country, there are not enough rains to produce water. 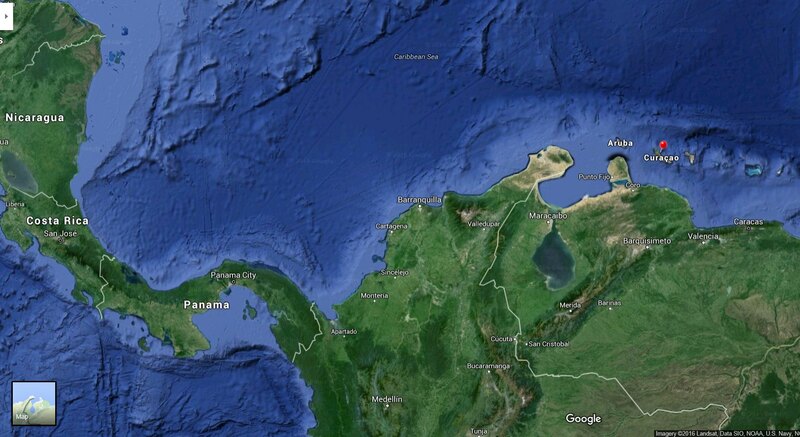 The water must be taken from the Caribbean sea and then undergo the process of filtering and purifying it at the plant. Because so much effort and energy goes into producing such high quality drinking water, the water becomes quite expensive. Even though the travellers are assured they will be getting the safest and purest water during Curacao vacation, some might still want to purchase bottled water. Just remember it will get on the expensive side and bottled water is the same quality as that from the tap. Aqualectra, Curacao's seawater distillery uses the process of reverse osmosis, which includes the salts and other chemical components being removed from the water. After this procedure, the water comes out tasty, clean, soft, without any chloride, a very low level of calcium and contains great bacteriological balance. The voltage in Curacao is from 110 to 130 volts and is at 50 cycles. These numbers are close to those used in the United States, so visitors from U.S. should have no problems using their small electrical devices. Issues might start with larger appliances such as hair dryers, as they may overheat on 50 cycles. Devices with timers might also not work accurately. If you are coming from Europe or some other place in the world other than the United States or Canada, please keep in mind that your converters and adaptors will become quite handy in Curacao. If you bring an adaptor plug, it will allow you to use up to 240 volts of electricity. Unless the appliance you bring with you is dual-voltage, the adaptor will not change the current or voltage. Hair dryers and sometimes even curling irons are available in the hotel rooms for guests to use, but if you would like to bring your own and it is not dual voltage, then pack a converter as well. Another important thing to keep in mind when traveling on Curacao vacation is that adapters can be grounded or non-grounded same as outlets and plugs. A non-grounded adapter is 2-pronged and grounded adaptors are 3-pronged. If you bring a non-grounded adapter, it may not be used with appliances that have grounded plugs. For something like that, a grounded adapter is needed and vice versa.